While the ancient tales, legends and centuries old adventures lay safely inside the old city walls, there is a different, but nothing less magical world outside of those borders. It is sometimes hard to define where the modern city of Split ends and the surrounding areas begin. The ever-developing modern time connections are constantly tying them closer together making a dynamic and modern urban zone. 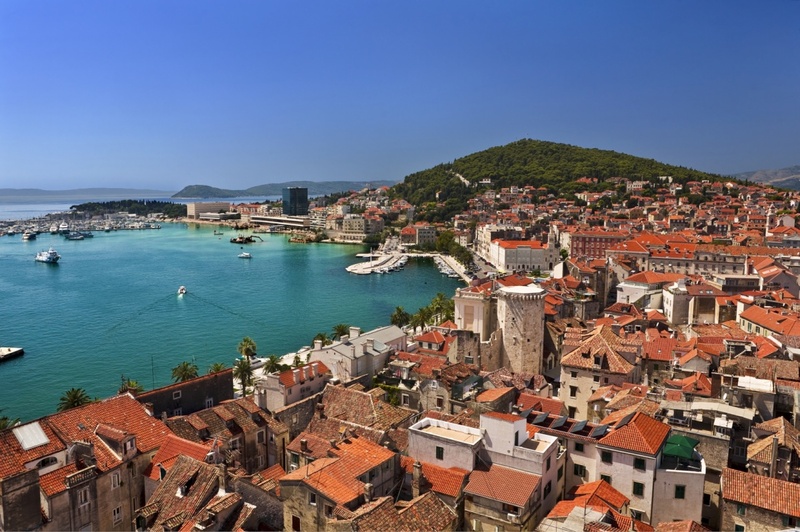 The modern city of Split spreads across the hills-covered peninsula hosting numerous city areas, every one of them with its own unique story and something new to offer. It is therefore needless to say that the charm, beauty and the importance of Split extends far beyond the ancient walls of the Diocletian’s Palace. You can find all the attractive features scattered across the wider city area. There are archaeological findings, hotels, restaurants, nightclubs, shopping centers, beaches... everything you, as a demanding tourist, might require. Be sure to visit the medieval fort Gripe just outside of the city center. Its massive walls, once built as a protection from the Turkish invasions, are now hosting a marine museum, a fine arts academy and a rather large flock of free roaming peacocks. The nearby Radunica offers a unique experience of the romantic Mediterranean town with its traditional Dalmatian houses and stone covered streets. And if you wish to explore the areas outside of the blurred city lines, hop on the bus or get in the car and head towards Solin. This lovely, just a few kilometers distant town lies beneath the ancient remains of the great Salona. You can explore the mystical, more than two millenniums old monuments of the old city, and then head towards the modern Solin center to enjoy a refreshing ice-cream of a cooled drink by the enchanting mini-waterfalls of the river Jadro. Direct your gaze above the Solin’s rooftops and you will find, proudly showing between the two mountain ridges of Mosor and Kozjak, the fort of Klis. It is another short ride, a few kilometers up to the hills. Even during this short trip, and especially when you arrive at the fort’s walls, you can admire the breathtaking view of the entire Split area and the surrounding islands. Apart from its magnificent fort, Klis is famous for its deliciously prepared lamb meat. You can try it in one of the numerous local restaurants and taverns. And then, with pleasantly filled stomach and a peaceful mind, you can head back to the big city and seek refreshment on one of the beautiful local beaches or you can continue your adventure and explore the wider Split area even further to discover some new unforgettable sights and create more precious holiday memories. Find information about selected Hotels, apartments and rooms in City of Split to choose the perfect place for your accommodation.